We have a huge portfolio of villas, apartments, bungalows, penthouses, semi-detached houses, plots/land and commercial properties like shops, hotels and holiday villages, etc. We can also offer new apartment projects for our investors for rental investment. When you visit Northern Cyprus we invite to pop into our office, and discuss your requirements with our experienced staff over a cup of tea/coffee followed by a visit to properties on request. Our property advice and viewings are free of charge. After you select your property we will then take you step by step through the whole buying process. Our outstanding agents will make sure that buying a property in Northern Cyprus will be stress-free for you. Why Sell Properties with Royal Estates ? •Now Royal Estates offers free valuation for your North Cyprus properties for sale! If you are selling a property in North Cyprus, please contact us for free valuation, or for free advice regarding selling procedures and taxes. •Only 4% Sole Agency Fee! Royal Estates is happy to offer Sole Agency to any of our clients at a reduced agency fee of 4%. •Royal Estates is known as the honest, trustworthy and professional Property Sales Specialists, and our main company objective is to assist people buying and selling properties in Northern Cyprus. Royal Estates has helped hundreds of happy clients to sell their North Cyprus properties,since 1995, in any area along the North coast of Cyprus. •We have very effective marketing & sales department working hard for you every day to sell your property. As well as on our new web page, we can advertise your North Cyprus property for sale on our office window displays, within quality international property websites and in local property magazines that have a proven record of interest from potential buyers. • We will also provide you tips on presenting your property. If your property needs a lick of paint, a spring clean, or any handyman jobs that need to be completed before you sell, our after sales department are here to help you. We have plenty of recommended local tradesmen and painters that can help you get your property in tip-top condition before the sale. Please contact us if you want to Sell your property fast and hassle free! Call or email us today for Free Valuations!! Rent your property with us! We are the biggest and most experienced rental management company in Northern Cyrus. We are currently managing over 400 properties. Royal Estates has been offering rental properties since 1995. If you would like to rent out your property, just call us and we will value your property for free of charge. Royal Estates offers both medium and long-term lets. We cover the entire Kyrenia region. Our lettings team can also help you to furnish your property, including air conditioning and white goods installation, to make your property ready for letting. We can make the necessary arrangements for your property fittings and also get you discounted prices from the local shops. Kitchen: Washing machine, oven + hob, extractor fan and fridge/ freezer are essential. Other kitchen equipment is optional, but will help with the renting of the property. Guest bedrooms: Twin beds, bedside table and curtains are essential. Air-conditioning would be helpful. Bathrooms: Shower screen or shower curtain, bathroom accessories (toilet roll holder, towel rail, mirror) are essential. Master Bedroom: Double bed, bedside tables and curtains are essential. Air-condition unit would be helpful. Living Room: Lounge suite, coffee table, mats, sufficient lighting, TV + stand, dining table/chairs and air-conditioning unit are essential. The property should be in good condition, clean and presentable, and all the appliances in working order. We can also help you to furnish your property, including air conditioning and white goods installation, to make your property ready for letting. We can make the necessary arrangements for your property fittings and also get you discounted prices from the local shops. If you intend to let the property unfurnished, we suggest that light fittings, bathroom accessories and curtain hangers be fitted in the property prior to letting. Would you like to let your property – stress and hassle free!? Rent your property hassle free! Call or email us today for Free Valuations!! Royal Estates offers one of the best complete after sales services to its customers which also differentiate us from our competitors. We treat our customers like our friends, and show them our traditional Turkish Cypriot hospitality. We know very well that it is not easy to settle down in a foreign country; therefore, we provide you local knowledge and guide you on all issues that may concern you, whilst settling down in your new home in Northern Cyprus, whether this is just a holiday home or for permanent residence. We can recommend you the shops where you can find all kinds of furniture, kitchen appliances, air-conditioning units, curtains etc. The most important point is that all of these shops will give you a discount, or at the very least a present, if you are introduced by us. Discounts are available mainly because of the high volume of transactions Royal Estates is able to achieve through its clients. For us, it is no problem to accompany you to these shops. From the first moment we meet, until you settle down in your new home, our principle is to help you throughout. We are very proud to be one stop shop for all your needs. There are many properties for sale in North Cyprus. 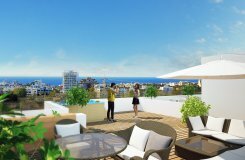 However, you may want your Northern Cyprus property to be unique and tailored to your exact requirements. At Royal Estates we can help you through the whole process, starting with finding your ideal plot in Northern Cyprus. We will then introduce you to English speaking and qualified Architects, Builders, Surveyors and Project Managers. They can obtain all the necessary permissions and licenses, and also supervise construction in your absence until the final stage is complete and ready for your occupation. The first step, you will take, is to choose a North Cyprus plot that will perfectly suit you. We have a huge variety of plots ranging from small ½ donum plots to larger 1 donum plots (Foreign buyers are allowed to buy a maximum of 1 donum plots - 1338 m2 or 14400 ft²). We have the largest portfolio of plots/land covering all areas of Northern Cyprus. Whether you require an elevated mountainside, beachfront location or private and secluded plot with sea and mountain views, we are confident that we can find the ideal plot to suit your needs. However, if you find your plot elsewhere, we can also assist you with your villa design, with fully experienced architects and builders in Northern Cyprus. We can recommend you a reputable and qualified architect, who will work closely with you, to design a property that meets all your requirements at reasonable rates. Your architect will supply you with precise constructional drawings, 3D images, plot and site plans. Once the design is finalised, the permission to build is applied to the Authorities on your behalf. Developing your new home in a foreign country can be a very difficult and frustrating. There are too many construction companies in North Cyprus, therefore it is important to choose the most reliable and experienced construction company to build your new home. Royal Estates does not carry out any construction business, therefore we are able to provide you with our unbiased opinion and, most importantly, local advice in choosing your builder. No matter what you're looking for in home design, you can find it in today's market. It is important to choose a builder who is trustworthy and knowledgeable in new home design, and who is comfortable in accurately building custom plans. That is why we work with only the most reputable and long established construction companies and architects in North Cyprus. When you decide to build your house in Northern Cyprus, we will be glad to arrange any meetings with reputable construction firms, who will provide you with the best possible quotation. An accurate quote for the construction of your property will be given to you according to the specification you have provided. A building contract will be drawn up after you verbally agreed all the terms and conditions. Perhaps you may not be present in North Cyprus during the construction of your property. In this case, your builder can provide you with regular photos and reports at each construction stage. At the completion of construction, you will be asked to “snag” the property, so that it is satisfactory to you. Any snags (if any!) will then be corrected by the builder. In addition, we are happy to direct clients to excellent suppliers of all household items, furniture and electrical equipment. Guidance is also available for services such as landscape gardening, air-conditioning, central heating and white goods installation, pool maintenance and interior design services. We have a property management section who will attend to all your requirements should you wish to rent your property. Below you will find a sample of North Cyprus properties already designed and build by reputable architects and builders; which can always be modified to meet your requirements. a) Outside the Municipal boundaries, there are restrictions on the area that one can build on. Usually you can build 35% of the land area, and a height restriction of two storeys. b) Land in North Cyprus is measured in donums. 1 donum consists of 4 evleks. 1 evlek = 3600 ft², 1 donum = 1338 m² or 14400 ft², 3 donums = 1 acre. Building costs for villas vary, depending on finishing, which usually starts from £400 Stg per m². Most buildings are constructed in the reinforced concrete frame system that is prevalent in Mediterranean countries. Some of the basic standard specifications include: damp-proof course, double glazing, fitted wardrobes and kitchen units, ceramic flooring, 3 tons of water storage with solar panels and hot water immersion system, paved parking lot, etc. You can always upgrade the finishing standards by paying an extra cost. Materials are readily available from Turkey, Spain, Italy, Germany and UK. ADVANTAGES: You can choose a wide variety of locations for your plot. Your villa can be custom made according to your own taste and requirements. You are able to choose the latest designs and the most technologically advanced components. In addition, you can pay a fixed contract price with stage payments, instead of lump - sum cash, which assures you of capital growth during the construction process. DISADVANTAGES: It can cost you more than a resale, or standard design villa. There can be some delays during construction time. Constant checks are required to make sure that the construction is going according to plan and your requirements. Finally, it can be difficult to get the planning permission and building license in certain circumstances. However, this is an area where our expertise and advice can be most helpful.